When federal aid just isn't enough—We're here to help! We've partnered with CU Student Choice to meet our members' needs for funding the cost of higher education through Dupaco's Extra Credit Student Loan. Students planning to attend college are often faced with a gap in funding to pay for school–the gap created when grants, scholarships, and state and federal aid don't cover the full cost. This can leave students scrambling to figure out how to pay the remainder. Prior to obtaining a private student loan, it is in your best interest to first consider all other applicable forms of federal, state and institutional financial aid for which you are eligible, including federal student loans. To explore these other funding options, you should work with financial aid professionals at your respective college or university. Accepting a private loan before utilizing other types of aid available may decrease your eligibility for federal, state and institutional aid. Not in school anymore? Consider refinancing! Dealing with making payments on several student loans is stressful. Ease your mind and potentially your wallet by refinancing and consolidating your student loans from one or more lenders—allowing you to walk away with a single student loan payment that you can manage with Dupaco. 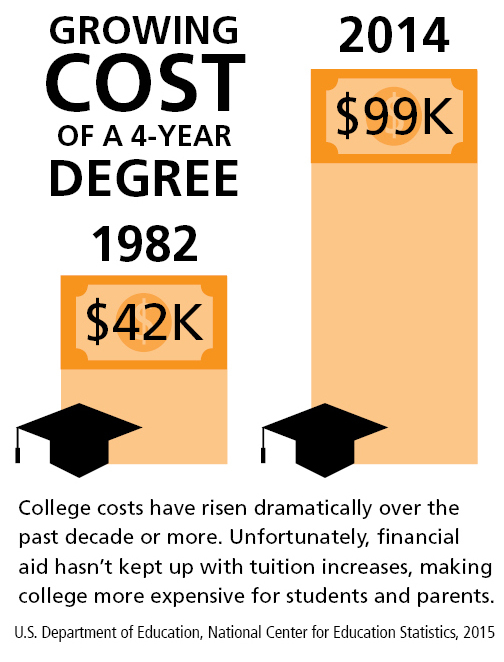 Break it down: What will college really cost you? As well as offering our resources, Dupaco has partnered with iGrad to offer you the best financial education tools and resources available so you can make an informed decision about your college financing options. Additional calculator resources that pertain to specific repayment plans can be found on our partner, iGrad's financial wellness site.